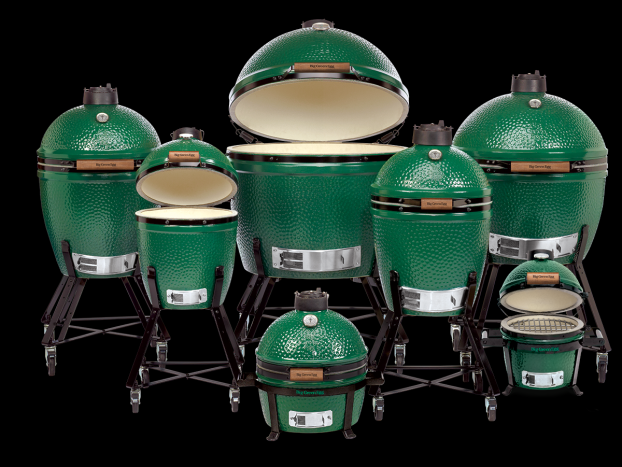 Whatis the Big Green Egg? The Big Green Egg is a smoker, a grill, and an oven all in one. Made of modern heat holding ceramics, it is currently the most unique barbeque product on the market. It has more smoker and grill capabilities than all other conventional cookers combined. You can even cook an entire meal at once, including vegetables, even pies, using the Big Green Egg! Unlike other charcoal grills, the Big Green Egg is ready for cooking in only 10 minutes, uses very little charcoal and the temperature can be maintained with accuracy for hours in any kind of weather without adding fuel. It also has both top and bottom adjustable dampers that make for easy temperature control and a fast start time; your Big Green Egg will be up above 220°F in only 10 minutes! It is also able to maintain temperatures of over 700°F, which is ideal for pizza or seared steak and fish. When you are finished cooking on the Big Green Egg, you just close the lid and the top and bottom drafts to extinguish the fire. Since the remaining, unburned charcoal is reusable, a 20 lb. bag of natural charcoal will usually provide 2-3 months use, even if you cook out several times per week. The Big Green Egg can also be used in all climates, including rain and snow, even in freezing temperatures. Not only can the Big Green Egg be used on a wooden deck, it is also safer around small children than a metal cooker. This is because the surface stays cooler and the fire is enclosed within a small area. The Big Green Egg has a lifetime baked on glaze, which maintains its good looks and easily wipes clean. Inside, the heat will burn off the grease from the ceramics like a self-cleaning oven and the porcelain coated grill wipes clean. Why does food cooked on a Big Green Egg taste better? The Big Green Egg ceramics hold heat and moisture extremely well. For this reason, foods do not dry out, as in metal charcoal, gas, or electric grills. Natural juices and flavors enhance the taste. The Big Green Egg operates without the need for water or endless hours of tending. Meats and other foods are juicier, with little or no shrinkage. The Big Green Egg gives a natural and wholesome flavor to all your foods. There is no metallic taste. When baking, you’ll get a “brick-oven” flavor and crust.